Do you have fascination for fairies? Unable to forget those fairies about which your grandmother used to tell you interesting tales? 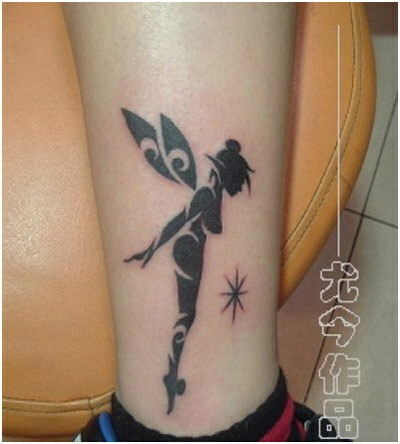 These cute fairies are some of the most popular tattoo designs among girls these days. The basic design of the cute little girl with wings itself is very endearing and visually appealing. You can even go for Goth style fairies which signify evilness. Fairies are considered as charming creatures which are difficult to catch. 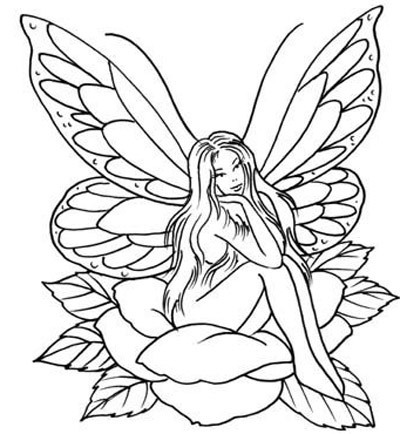 Large size fairy tattoo designs looks nice on the upper back side, breast or leg. These fairies love nature and you can get these fairies with inked on your body with other nature elements. Add colours to it to give it a complete nature and artistic look. These tattoos signify your love for nature and its beautiful fairies. Baby fairies look very cute, delightful and adorable. 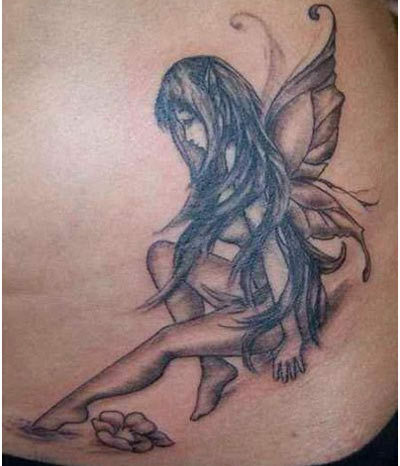 You can get these baby fairy tattoos inked on your skin to get a sweet and charming look. Adding colours will make it more striking. Do not like bright colours on your body? Get a black and white tattoo made on your body which looks very attractive. Tribal fairy tattoos look best when inked completely in black. They look interesting, unique and charming. These designs can be a simple though even elaborate ones look best on the lower side of your body. Crazy for fairy wings? Want to have your own? 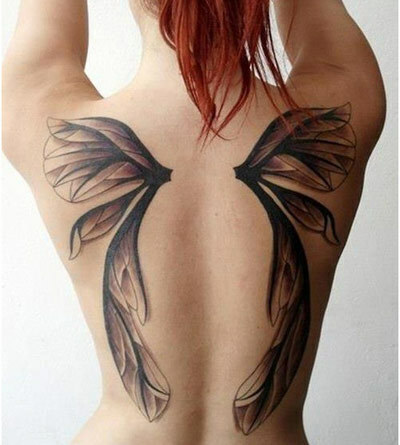 Get only the fairy wings tattooed on your body. These look best on the upper back side of your body. Add colours to them to make the wings more striking and soothing to eyes. 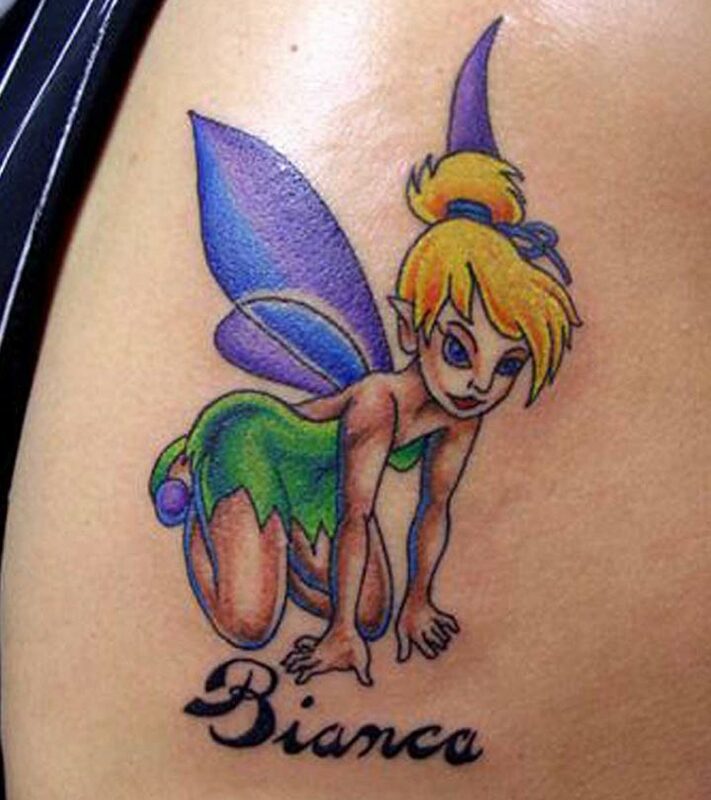 These give a complete different look than normal fairy tattoos for girls. Butterfly wings will make your tattoo look more innovative and creative. You can even innovate your simple fairy tattoo by giving it a mesmerising mermaid look. Love the evil fairy look? 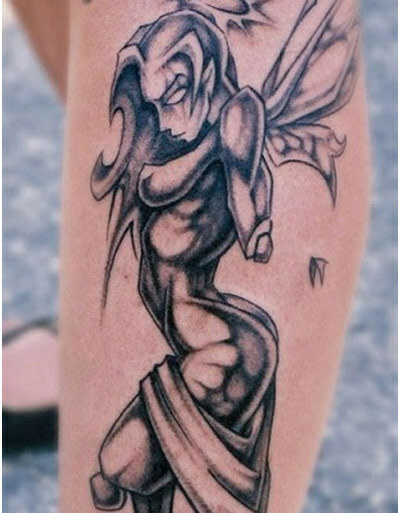 Get an evil fairy tattoo design made on your skin which looks very attractive and eye catchy too. Evil fairy tattoos are associated with black magic and witch craft. These tattoos are very uncommon because of its evil significance. Fairy tattoos always look good and choosing the type according to your personality is the only task which you need to do. 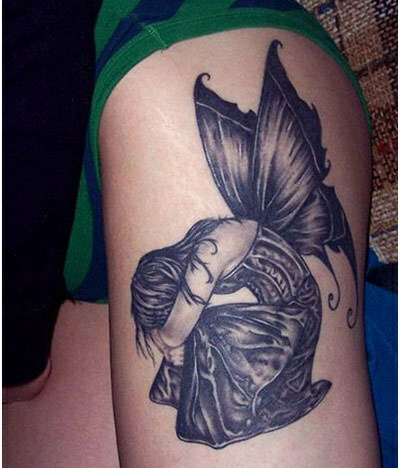 Sad fairy tattoos also look good but might give an impression that you are very sad with your life. 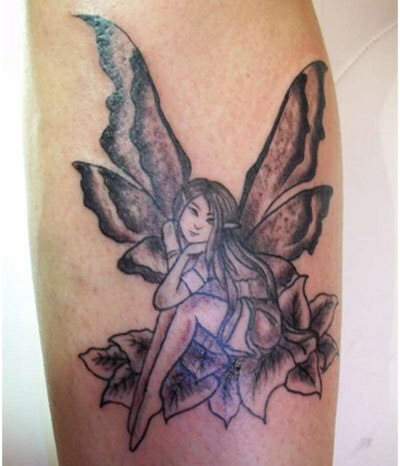 Fairy tattoo designs represent anything from youthful sensation to innocent aura. Fairies are beauties of naughtiness and mysteriousness. 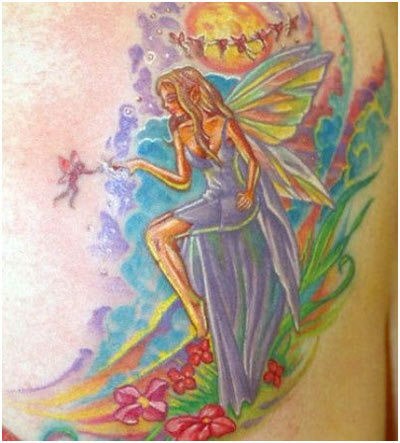 Get a happy, playful and colourful fairy inked on your body. These tattoos will signify that you are happy with your life and trying every possible way to make it more beautiful and happy. Do you fancy living in a colourful imaginary fairy world? 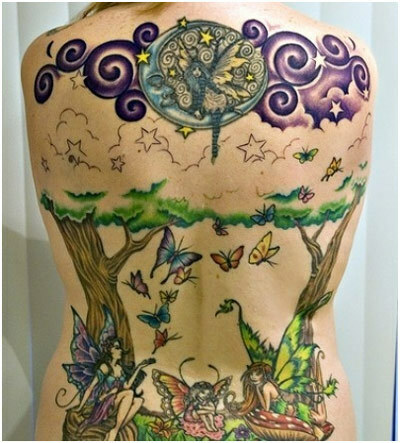 Getting a complete beautiful fairy world inked on your body is a nice and unique idea. Tinker Bell is an animated Disney fairy who is Peter Pan’s trusted pixie friend. She helped Peter Pan teach Wendy and her siblings how to fly before leading them to Never Land, the magical world in which children never grew up. 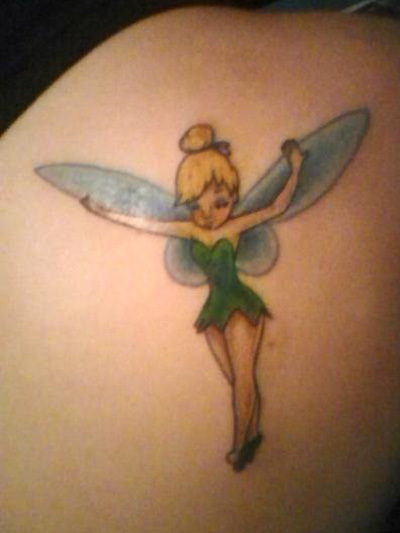 Having Tinker Bell inked represents the childish and fun loving side in an individual. 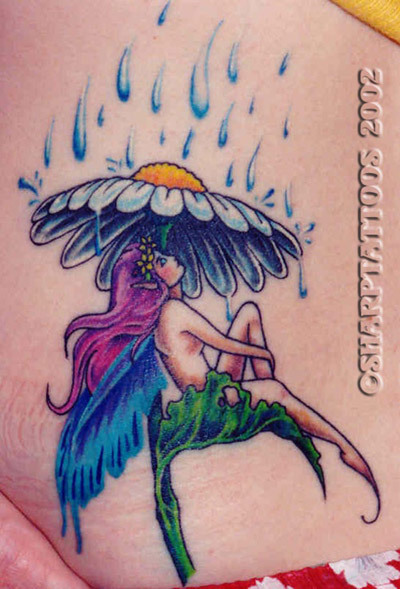 A fairy tattoo design can have many adaptations. One such adaptation might be that of a fairy sitting under a flower, taking shelter from pouring rain. Colour could be added to make the tattoo look artistic and pretty. Fairies are generally considered as beings that live in the midst of nature. 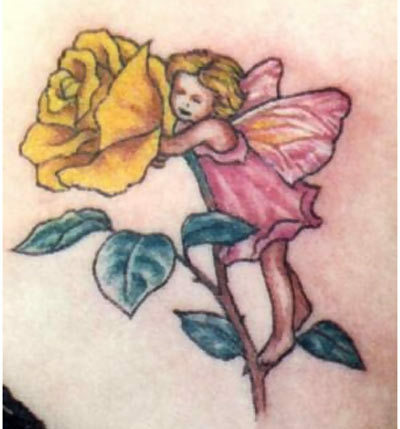 That is why a tattoo of a fairy sitting on a flower would be an apt adaptation of a fairy. The fairy is depicted with long flowing hair and elaborately decorated wings. 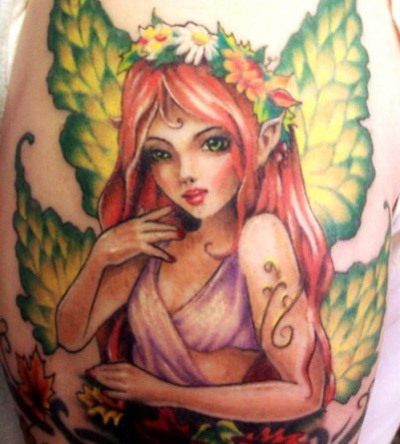 A fairy tattoo that is coloured completely would be a very artistic way to decorate one’s body. 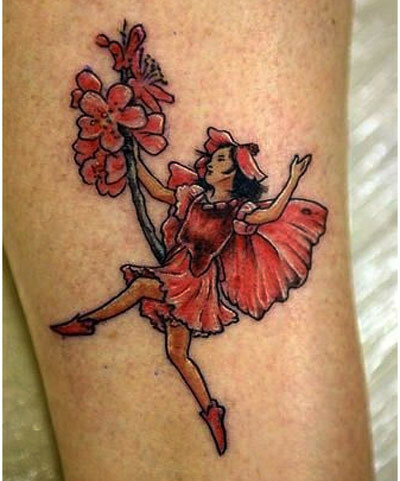 A tattoo is a form of body art and a fairy tattoo in all its colours would be a grand and majestic way to ink oneself. So, which of these fairly tattoo designs impressed you the most? Which tattoo you are going to get inscribed over your skin? 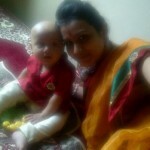 Please share your comments with us. 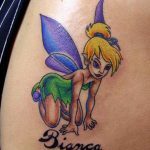 More than 60 fairy tattoo ideas on ‘Tattoos for all app‘ along with 43 other categories to shape your idea. Choose from more than 60 fairy tattoo ideas on ‘Tattoos For All App‘, along with 43 other categories to shape your idea.